Coretta Scott King (center) with strikers, Charleston, South Carolina, 1969, courtesy of the Avery Research Center. Left to right: Julia Davis, Mary Moultrie, Coretta Scott King, Rosetta Simmons, Juanita Abernathy, and Doris Turner. The Charleston area is full of civil rights history, but until recently, those passing by the places where history happened might not even know it. Several years ago, the Preservation Society of Charleston joined the mission to help preserve the history and culture of area African Americans. It created the Charleston African American Preservation Alliance, which later took the name, the Thomas M. Pinckney Alliance of the Preservation Society of Charleston, to honor Thomas Mayhem Pinckney, the artisan who helped the Society founder Susan Pringle Frost in much of her early preservation work. 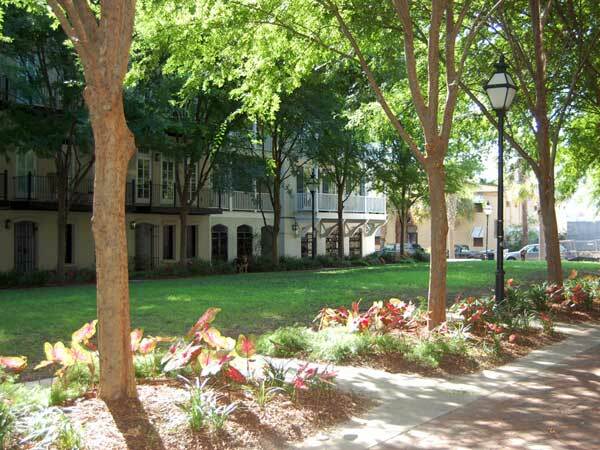 The purpose of the Thomas Mayhem Pinckney Alliance is to support the Preservation Society of Charleston in identifying and preserving historic African American “built environments” in the Lowcountry. This includes those sites built by, occupied by and utilized for activities significant to the African American experience. The Thomas M. Pinckney Alliance also advocates for the expanded participation of African Americans in the Preservation Society’s activities and efforts. One of the first accomplishments of the Alliance was to install plaques to commemorate five sites important to African American history in Charleston. A poll was posted with twelve locations nominated; those sites with the most votes were identified and their plaques have gone up over the last few years. Those that made the list include the Progressive Club on John’s Island, a “Citizenship School” from which Esau Jenkins shuttled African American residents to work in his famous bus while educating them and encouraging them to vote. The old Kress building (now Williams Sonoma) on King Street was the site of a 1963 sit-in by Burke High School students. 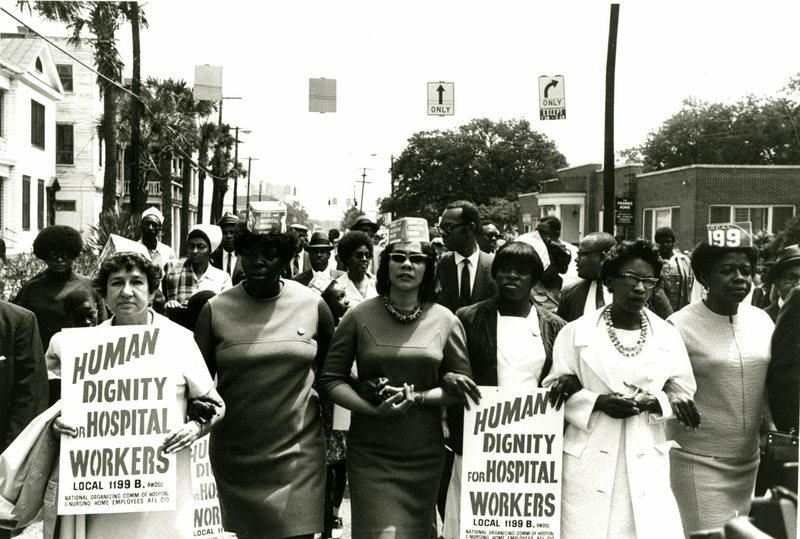 The Medical University of South Carolina was the site of a three-month long strike by mostly African American hospital workers--arguably the city’s largest civil rights protest and one that ended peacefully. In addition, the James Simons Elementary school on the corner of King and Moultrie Streets was honored for the role it played in Charleston County School desegregation. And, finally, the Cigar Factory was recognized as the site of a pivotal strike that in 1945 laid the foundation for the civil rights movement a generation later, where the song “We Shall Overcome” was first utilized by the movement. Brooks Motel at the corner of Morris and Felix Streets. Photo taken on 1/25/1990 by Steve Rhea. Posted on LocationsHub. The list also includes the old County Hall at 1000 King Street, now used as apartments. During the Civil Rights movement in the 1960s, this was used as a detention center for demonstrators and Reverend Dr. Martin Luther King, Jr. spoke to a crowd of 2,900 people here when he visited Charleston in July, 1967. Also included on the list is the Morris Street Business District in the Cannon/Elliottborough neighborhood, which is where numerous successful Black-owned businesses thrived for years. 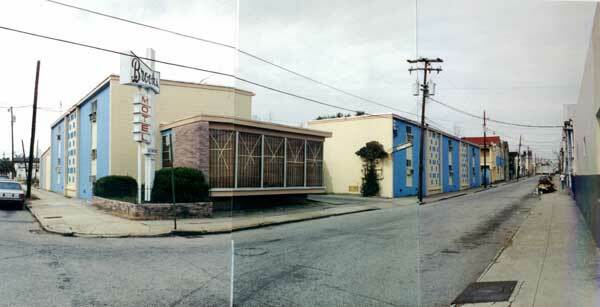 On the corner of Morris and Felix Streets, the Brooks Motel and Restaurant (pictured above) served as a local headquarters for the Civil Rights movement in Charleston; Dr. King stayed here in June, 1963. The Brooks Motel was approved for demolition in 1995 and demolished around 2001. Ironwork by Philip Simmons is still in good condition on Mr. Brook's now-empty real estate office across the street. While many people still remember the Brooks Motel, other buildings in the area aren’t so well remembered--or documented. One half of a stereoscopic view of the Morris Street School, which was later named the Simonton School. Located on the block bounded by Morris, Smith, Marion and Jasper Streets near the intersection of the Cannonborough, Elliottborough and Radcliffeborough neighborhoods. Archival photograph is in the collections of the Historic American Building Survey (HABS) and the Library of Congress (LOC). Photo taken in 1891. Another "What used to be there?" Further down Morris Street is a block bounded by Jasper, Morris, Smith, and Radcliffe. This block was an empty lot for over thirty years before it was transformed into today’s “new urbanist” infill project, Morris Square. But for over 100 years, Simonton School stood here, originally called the Morris Street School. 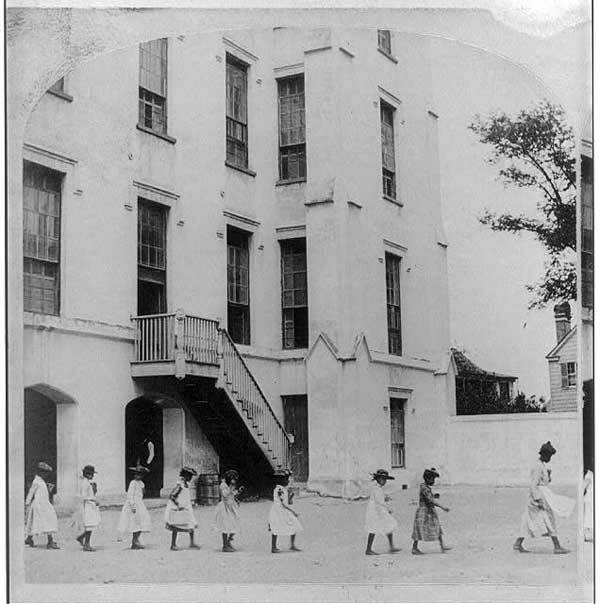 Later renamed the Charles H. Simonton School, it was constructed as one of four elementary schools originally ordered to be built by the Charleston City Council in 1856 and was the first public school for African Americans in Charleston. Although it was against state law at the time to teach anyone of African descent how to read and write, the school was designated for use by children of Charleston's large free Black population. Thus, the publicly funded school supported by the City was actually in direct conflict with South Carolina's Black Codes--and this, years before slavery was outlawed. Simonton School and its campus--the entire city block-- was sold to private interests by the Charleston County School District after 1970 for less than $100,000. The building was torn down by the buyer and its brick sold for more than the purchase price. The site was used for many years as a surface parking lot and an athletic practice field by two different private schools. Some time after 1999, the entire vacant lot, containing less than 2 acres, was sold to another private owner for approximately $2,000,000. It is now the site of a major urban infill mixed use high end residential project known as Morris Square. Please check out Ruthie’s listing at 5 Simonton Mews...it’s got a welcoming open floor plan overlooking the Square. For more information about the neighborhood and what’s currently available, click here. And next time you’re up on Morris Square, give a thought to the children who went to school here, oh so long ago. The Charleston area is full of civil rights history, but until recently, those passing by the places where history happened might not even know it. Let’s take a spin around town and check some of them out...some of these might surprise you!